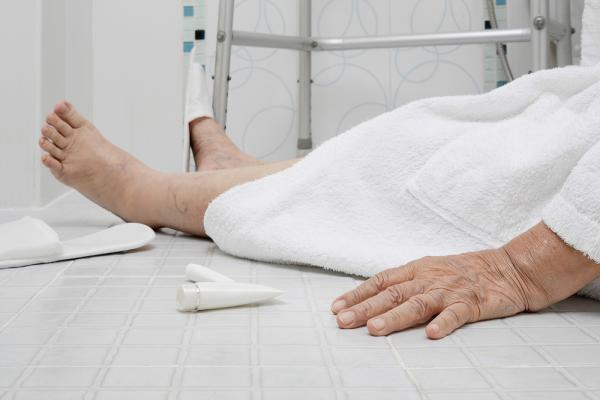 We know falls are the #1 leading cause of injury among older adults over the age of 65. 1 in 2 people over the age of 70 will have a fall this year, and more than 1 in 10 of those falls will result in a bone fracture or head injury. Those are huge numbers. While we can do many things to prevent falls, like improve our strength and balance, check our medications and make our homes safer, there are still those among us with health conditions that increase our risk of falling. In fact, the more health problems you have, the bigger the chance you have of falling. If you have no health problems your chance of falling is 1 in 10. If you have 4 or more health problems your chances rise to 8 in 10! Let's take a look at what some of those health problems are and what you can do to minimize the chance you fall from them. Falling is one of the most common complications of strokes, with 25% to 30% of stroke patients experiencing a broken bone from a fall. The biggest risk factors for falling for recovering stroke patients are balance, cognitive function and their ability to perform activities like eating, bathing, dressing and going to the bathroom on their own. The risk factors associated with arthritis include lower body muscle strength, postural stability (balance), number of swollen and tender lower extremity joints (feet, ankle, knees), pain, fatigue and use of psychotropic medications like Xanax, Prozac and Ativan. There are several fall related risks associated with diabetes including hypoglycemia, which causes blurred eye sight, dizziness and frailty. Nerve damage (peripheral neuropathy) causes foot and leg pain, sensation loss and numbness that can cause a poor gait and imbalance. Diabetic retinopathy causes poor eyesight and diabetic pephropathy can impair vitamin D levels, reducing muscle and bone strength. While falls are more likely to happen in the later stages of Parkinson's, they can, and do, happen at all stages. The biggest risk factors for falling from Parkinson's include "freezing" (trying to move, but it feels like your feet are stuck in concrete), shuffling steps, low blood pressure, slanting forward. Surprisingly, depression has one of the highest links to falls of all health conditions. A moderate rise in depression has been shown to increase your chance of falling by 30%. Part of the problem is that an excessive fear of falling, which is common among older adults suffering from depression, increases the risk of falling. Additional reasons of why depression increases the risk of falling is the use of anti-depressants which can cause drowsiness and low blood pressure, which can cause dizziness. A fall occurs in 30% to 50% of cancer patients over the age of 65! Why? Research suggests it's because some chemotherapy treatments cause nerve damage (neuropathy) and vision impairment increasing the risk of falls. Pain medication and anti-vomiting and nausea medication often cause sedation , which also increases the risk of falling. Also, some tumor fighting treatments (antineoplastics), can also cause muscle loss, which make it harder for patients to recover from an initial stumble, increasing the likelihood of a fall. Older adults with chronic kidney disease (CKD) are more at risk of falling, mostly from low-energy falls, and suffering from a related injury than the general population. The fall risk factors resulting from CKD include low blood pressure, vitamin D deficiency, low muscle mass, diabetes and anemia. The conditions can cause dizziness, muscle weakness, loss of sensation in the extremeties and frailty, all contributing to a higher chance of falling. Some research suggests that COPD is only second to arthritis in chronic conditions causing falls, with 25% to 46% of those suffering from COPD experiencing a fall. Interestingly, for those suffering from COPD the biggest risk factors for falling were a previous fall, coronary heart disease, age and being female, in declining order of significance. People with dementia have a higher risk if falling than the general population because they are more likely to have issues with balance, muscle weakness, depression, travelling "safe" routes free from falling hazards, difficulty reacting to fall prone situations and medications causing drowsiness and dizziness. Medical alert systems: Perhaps the least invasive, cheapest and easiest to implement precaution you can take is to get yourself one of the many monitored life alert systems. Press the button and help is on its way. You can wear them in and outside your home. In the shower or bath. Have the monitoring center reach out to emergency responders, family or caregivers. Have them come with automatic fall detection and a manual help button. Medical alert systems can also reduce the fear of falling, giving you the confidence to become more active, reducing two of the most significant risks of falling, fear and immobility. Mobility aids: If you're feeling dizzy, weak or unbalanced you might want to consider using a mobility aid like a cane or walker. Vitamin D and calcium: Long a standard prescription to strengthen bones, recent research suggests vitamin D supplementation has no effect on reduction of falls or injury from falling in seniors or those suffering from osteoporosis. That said, if you suffer from low vitamin D levels, you might want to discuss your situation with your doctor. Meet with your doctor: Get your condition, or any of its side effects treated. If you're suffering from joint pain, talk with your doctor and see if you have arthritis. Properly prescribed medication, can reduce the pain and inflammation, reducing your chance of falling. Review your medications: Many of the medications used to treat chronic health conditions can increase your likelihood of falling. You're likelihood of falling increases dramatically when you're taking multiple medications. If you're experiencing drowsiness, dizziness or confusion have your doctor and your pharmacist review your medications for alternative dosages, frequencies or prescriptions. Balance and strength training: Many chronic health conditions result in muscle atrophy or weakness. Ask your doctor what, if any exercise you can do to maintain or increase your muscle mass and strength. It could simply be walking or working on a stationary bike. Vitamin D: Many chronic health conditions and/or their treatments can affect your vitamin D levels. Low levels of vitamin D can cause low muscle and bone strength, increasing the magnitude of fall related injuries and the chance of falling itself. Discuss the benefits of vitamin supplementation with your doctor, given your situation. Falls are a significant risk to older adults and even more so if you suffer from chronic health conditions like arthritis, depression, diabetes, CPD, cancer, parkinson's or dementia. However, falls are one of the more preventable risks you face. Make sure you understand the reasons why you're at risk of falling and what you can do to reduce them. No matter what precautions we take, we'll never be able to eliminate the risk of falling completely. If you feel you're at risk, or you want extra peace of mind, take the appropriate measures to reduce the danger of a fall, whether it be a medical alert system, vitamin D or mobility aids.